Kathleen Phillips, originally from Michigan, moved to Colorado with a comfortable job at a well-known company. After her move, Phillips’s world was turned upside down in an instant when her father unexpectedly passed away. Her family had very little time to grieve because the loss put her family’s finances in danger. Lack of financial planning left them in a precarious position. That experience left Phillips with a renewed sense of determination. If she could help it, she wouldn’t let any other family go through what hers had. So, she set herself on the path of becoming a financial advisor. She landed a job at a Forbes 500 company, New York Life, here in Denver. She decided to continue her education by pursuing CU Denver’s Professional MBA with specializations in entrepreneurship and business strategy. She hopes to graduate in May and continue her mission to help families in need. Originally an undergraduate in criminology, Phillips knew she wanted to pursue her MBA in Colorado. She eventually made the move from Michigan to Denver and landed an operations job with AT&T for three years. Even though Phillips had a good job, she was looking for a new challenge. We all go through life experiences, both good and bad, that shape us. When Phillips learned of her father’s death, her and her family’s lives turned upside down. After 18 months of probate court, everything her father had owned was turned over to the state. Phillips, unabashedly determined, set a goal for herself to prevent other families from ending up in similar financial situations. She changed career paths and landed a job as a financial services professional at New York Life in Denver. However, the more she dove into the world of finance, the more she saw the need to further her education in financial planning. With a new job and initiative on her shoulders, she began the hunt to pursue an MBA that fit her career goals. She found CU Denver after a friend recommended the program to her. From her accounting classes to her marketing coursework, Phillips knew she had found what she was looking for. “I love the problem-solving we do in my marketing class. I’m applying the information directly to my career in financial planning,” she said. She began to think more critically about what audiences she was speaking at her current role at New York Life. She realized that her messaging and conversations with clients all depend on who she is targeting, whether that be young professionals, pre-retirees, or retirees. Recognizing those nuances will help her stand apart and provide a better experience for her customers. Through that one marketing course, she has now thought through how each life stage requires drastically different needs, wants, and behaviors. Phillips always had a huge passion for helping special need individuals throughout her life. When she noticed a financial trend among many special-need families, she once again found herself with a mission to help those families. When a guardian of an individual with special needs passes away and leaves an inheritance, that individual would no longer qualify for government benefits. As a result, that individual with special needs would be forced to spend down his or her inheritance before he or she would requalify for government benefits. Phillips knew this issue could easily be resolved by educating the families on the process and identifying better ways to invest money. To accomplish her mission, she hosts seminars in Denver supported by New York Life to educate special-need families on this issue. Phillips looks forward to continuing her education and hopes to expand her seminars to more families. 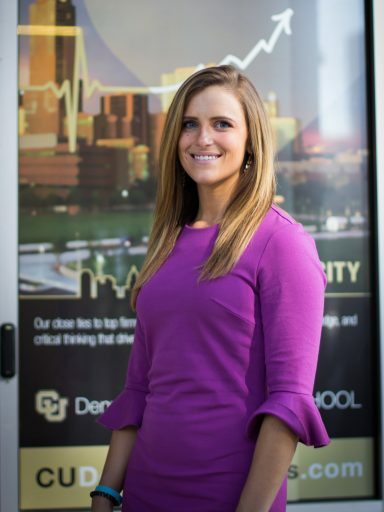 Down the line, Phillips’ goal is to own her own financial firm, using the entrepreneurial skills she picked up during her time at CU Denver to build a successful business plan. Phillips is someone who takes initiative. Her education at CU Denver was a calculated step in her process to make the greatest impact. She’ll leave CU Denver with the tools and knowledge she needs to continue making a positive impact, no matter where life takes her.